Drawing upon unprecedented access to participants, this ground-breaking book explores the history of Irish republican prisoners held in English prisons during the first phase of the Troubles. Categories: 20th Century History, Northern Ireland. This ground-breaking book explores the history of Irish republican prisoners held in English prisons during the first phase of the Troubles. The arrival of the first of over 200 IRA members into the Dispersal System challenged a penal environment devised to cope with a relatively small number of long-term criminal inmates and inspired a range of Home Office reforms. The republicans exacerbated tensions within the limited range of facilities suitable for ‘Category A’ prisoners and played leading roles in the major Hull Riot of 1976, as well as numerous other confrontations. 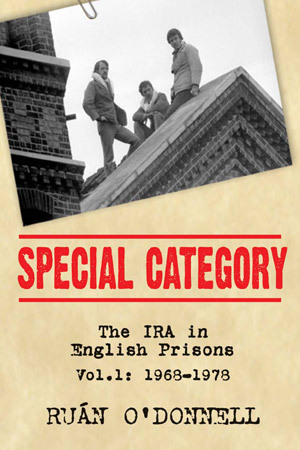 Special Category draws upon unprecedented access to participants in order to detail and analyze the phenomena of the IRA in English prisons. Extensive new information is presented on IRA activities within the Dispersal System, not least planning and participation in riots, protests, legal challenges, escapes (successful and unsuccessful), and violent actions.Day-to-day factors – such as interaction with British prisoners, family visits, education, ‘ghosting,’ and attitudes towards prison staff – are documented in depth. Extensive use has been made of private collections of correspondence and papers, state archives, political prints, and international media reports. Account is taken of the perspective of the Home Office and British government, based on declassified documents, memoirs of key protagonists, and official records of parliamentary business. The attitude of the Irish government is also assessed. The book also draws upon unprecedented access to participants. Over 120 ex-prisoners, republican activists, members of prisoner support organizations, and prisoners’ relatives have gone on the record. It is the single most authoritative and comprehensive history of any aspect the political prisoner experience in the modern Troubles. Dr Ruan O’Donnell is a Senior Lecturer in the History Department, University of Limerick. He has published extensively on the history of Irish republicanism and is a frequent contributor to the international media on the subject of the modern Irish Troubles. O’Donnell’s publications include Robert Emmet and the Rising of 1803, The Impact of 1916 (ed) and The Wexford IRA and the Border Campaign. He is editor of IAP’s ‘Irish Abroad’ series.